As we’ve had time to digest the news that Floyd Mayweather will go to 50-0 against MMAer Conor McGregor on Aug. 26, we’ve heard from pretty much every boxing big out there. Not many, if any, are expecting the Irishman to be able to compete let alone beat the master pugilist Mayweather in Las Vegas and on PPV. 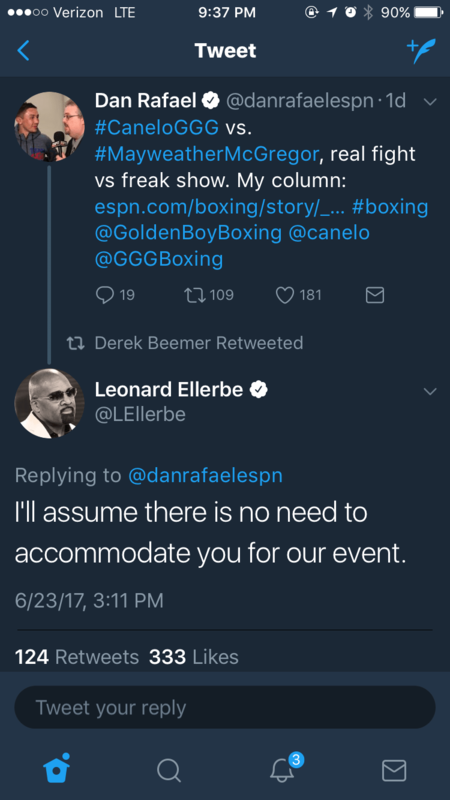 The industry leader in the boxing writer sphere, Dan Rafael, drew the ire of Mayweather right hand man Leonard Ellerbe when he wrote about the Aug. 26 tango, right after it came out that ESPN would be allying with Top Rank and showing Saturdays’ Manny Pacquiao v Jeff Horn fight. Ellerbe counter punched with a sharp overhand. Yes, for organizers promoting the Mayweather 50th bash, I think they might be finding it a harder hill to climb than they might have suspected. Hard to say, the powers that be involved wouldn’t be inclined to share their “truth serum” thoughts on the event, I don’t think, till after the big night. For sure, they have to combat a constant stream of naysaying. Like this exchange I had with Freddie Roach, trainer to Manny Pacquiao. But of course, most of us don’t forget that various people are backing different horses. Roach, his bread is buttered by Top Rank knives, more so…so he’d more willing to jab his fork at Mayweather affiliated fare. Who has a better shot to beat the favorite, Jeff Horn, or Conor McGregor, I asked Freddie. “No chance. Floyd’s ability and safety first attitude will guarantee that,” the trainer answered. And your quick take on Floyd vs Conor..
Now, over in the other camp, folks are seeing this whole spectacle differently. One smart suit I chatted with said that he thinks the “underdog has no shot” dynamic and labeling could be applied to the Pacquiao-Horn fight, same as in Mayweather-McGregor. OK…but the price tag for the PPV extravaganza, versus “free” on ESPN will mean that pre-judgements on the PPV will be harsher, no? My friend said that he sees ESPN giving more than ample coverage to the Mayweather event. “Certainly acting like it’s a super fight,” he pointed out. He went on to say that he sees the Floyd fight as “an exhibition,” and one which even “haters” will want to watch. It’s like a WWE event, he said. But because I think so highly of Mayweathers’ talent, I find it hard to fathom how the 0-0 pro boxer can win a round, as then B plus pugilist Canelo Alvarez only managed a couple years back. Further, I think there is a portion of fight fans who theorize that maybe Pacman didn’t treat Horn as a tough out, so maybe he hasn’t trained like normal. Whereas, it is well known that Mayweather has a ludicrous work ethic and isn’t susceptible to taking his eye off the ball. Get where I’m coming from?…In this forthcoming fight, Mayweather could fall victim, from a selling standpoint, to his own excellence. He’s too damned good for his own good! And to reiterate…different people have different dogs in the hunt. Many media are faced with a choice in their coverage that has to have their allegiances factor in. Me, I write for the RING website. Like my friend Mitch Abramson said on the Everlast podcast TALKBOX, he would think about it extra hard when writing about Oscar De La Hoya, the man who signed his paycheck. Mitch said he didn’t think he played it differently because Oscar owns RING…but, he admitted, he couldn’t be sure. It is for Rafael to answer if he might be subject to influence, even subconscious, because ESPN is showing Pacquiao-Horn. My friend the suit noted that writers are subject to biases, and some writers’ biases are considerable. Feel free to weigh in, friends. Your thoughts on the Mayweather-McGregor event, from a coverage perspective? Has it been fair…equitable…biased…honest?